Eden Hazard has denied having a strained relationship with Chelsea boss Jose Mourinho and suggested he wants to stay at the Premier League champions. The Belgium midfielder was one of a handful of players Mourinho had deemed to have underperformed this season. Mourinho has also been under scrutiny, with the champions 15th in the league, 14 points behind leaders Leicester. "I don't have a problem with him. We hope we can win a lot of trophies together," said Hazard, 24. "Maybe not this season because it will be difficult, but next season and on." 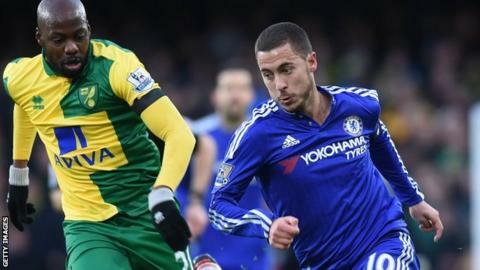 The Blues moved above Norwich into 15th with a 1-0 win over the Canaries on Saturday - it was only their fourth victory in 13 league games this season. Hazard, who was recently linked with a move to Real Madrid, has yet to score for the Blues in 18 appearances in all competitions in 2015-16. He managed 20 last season en route to winning the Professional Footballers' Association and Football Writers' Association player of the year awards. On his own form, he said: "I didn't start the season well. I tried to find out why, but I don't know. "Sometimes you don't know. You have to keep going. I gave everything in training, on the pitch when I played. "I hope I can get a lot of form and try to help the team win games."